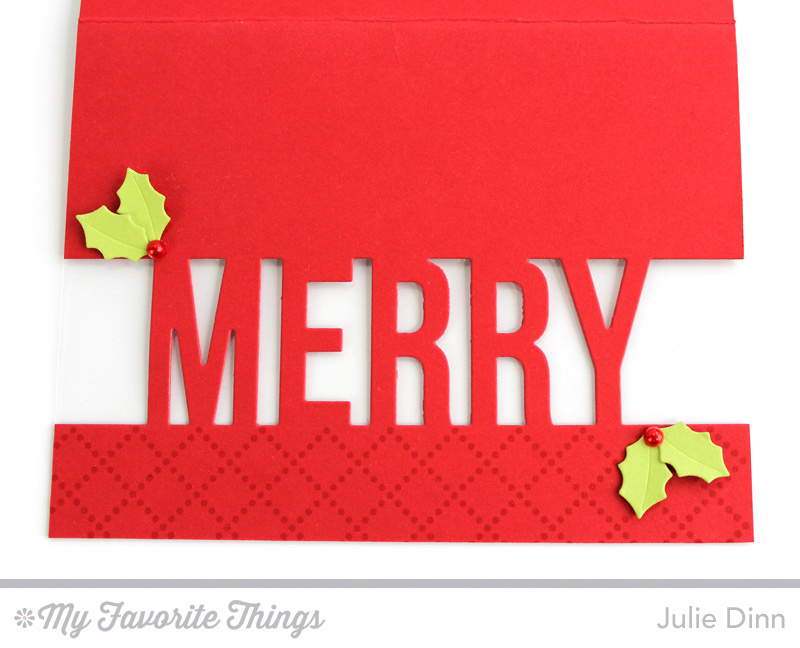 For my first card, I used some very traditional, rich holiday colors, Jellybean Green and Wild Cherry. The wreath was created with the Autumn Wreath Die-namics. I cut two wreaths and offset them slightly so the wreath would be nice and full. A few red sequins finished off the wreath in festive style. The banner greeting is from the new Merry Messages stamp set. 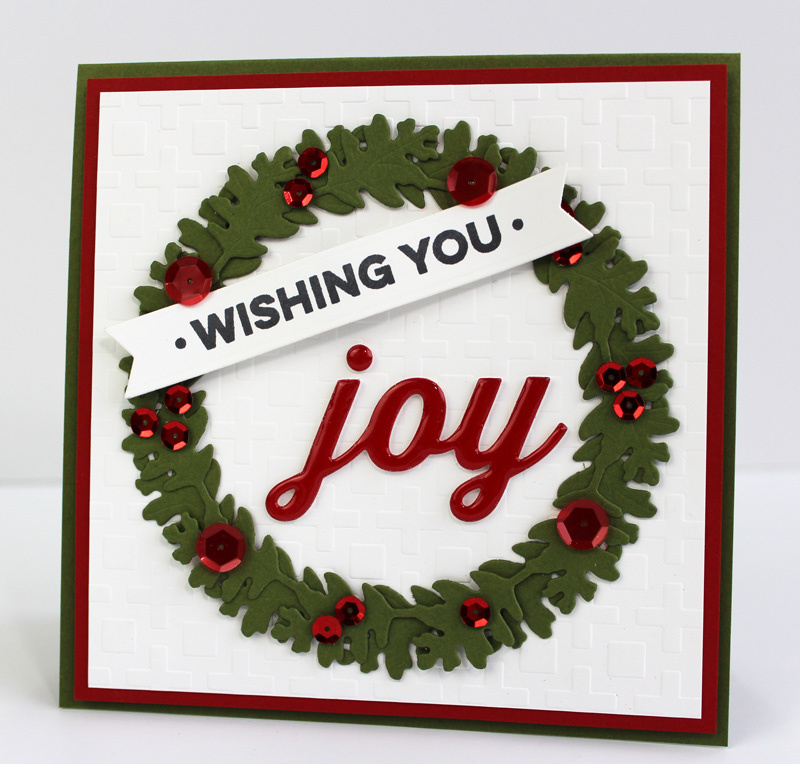 This set is just full of fabulous sentiments that you can mix and match to create the perfect holiday greeting. I'm sure you recognize the joy die-cut from the new Peace, Love, Joy Die-namics. I die-cut the word in Wild Cherry card stock and then applied a thick layer of Crystal Effects to it. I'm not sure how well you can see it in these photos, but I embossed the Smooth White card stock with the Positive Sign Stencil. I love the subtle texture this creates. I stamped the sentiments from the Merry Messages stamp set in Wild Cherry ink on a Stitched Square. My second card features the fabulous Merry Die-namics. This on-the-line die is fantastic! It is sized to fit on an A2 card either horizontally or vertically. I used it here to die-cut a piece of Wild Cherry card stock. I stamped the bottom of the card stock with the Diamonds & Dots Borders. I added a few small holly leaves to finish of the front of the card. I added a piece of acetate behind the card front and then I added a few pieces of card stock to the inside of the front of the card to hide the areas of the acetate that I didn't want showing. For the inside of the card, I used a piece of Sour Apple card stock. I stamped a sentiment from the Merry Messages stamp set in Black Licorice Hybrid Ink and I added another Diamonds & Dots border. Don't forget to stop by the MFT Blog to see all the creations the wonderful design team has to share with you. Love your second card. The sentiment die really packs a punch...very effective! That wreath is so pretty, I love te sequins on it. That Merry die is fabulous, I have to have it. I love the jewels in the wreath and using the acetate was an awesome touch! I like how you used the + sign stencil. The card is so classy. Thanks for the inspiration. Damn girl, these are great!